If you are a company looking to hire conference chairs, then you are in the right place here at Event Hire UK. Most companies at certain points in the year will need to rent conference chairs as they will be holding various events, the type of which can be wide ranging, including seminars and training days, shareholder meetings, product launches, press and media days and even simply internal conferences and meetings for employees from around the country. Of course, the quantities of conference chairs required will vary from company to company, depending upon the size of the company and their employee base. For example, single location companies will probably need smaller volumes of conference chairs than those larger companies who have multiple site locations and who want to hold a one day event, for example, for all their employees from around the country in one place. When it comes to your choice of conference chair hire, then yes price will be a factor, though probably not the final determining factor. Firstly, you will want to ensure that your chair hire products are comfortable, as the chances are that your guests will be sitting on these for longer than a few minutes – therefore, look for cushioned chairs with steel frames which will be not only comfortable but also robust. At the same time, the choice of conference chair hire for some companies might be decided by colour. It’s likely that in an ideal world, you will want your conference chairs to match your company logo, colours or identity. 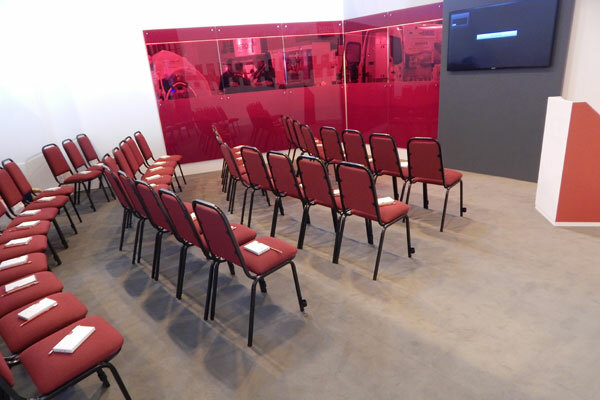 This is why here at Event Hire UK, we offer a range of different coloured conference chairs, one of which may well be the perfect match up to what you are looking for. Whether you need to hire chairs for conference in their ten, hundreds or thousands, then Event Hire UK will be able to assist. You can find conference chair hire within our wider furniture hire range online or simply contact one of our expert sales team who will be delighted to assist you today.